Description A sepia photograph donated to Norm Brayshaw for MHS on an unknown date by S. & E. Cannington, 19 Collingwood Street, Nelson. It shows the ship, Kennedy, at the Blenheim wharves in 1866. Written on the back of the photograph [probably by one of the Canningtons] is, "Kennedy 1866 April. At Blenheim", followed by the Cannington's address. Another person has written, "Kennedy at Blenheim". Photograph is stamped with Norm Brayshaw's photograph number. There are two Norm Brayshaw copies of the photograph in the same packet, plus a negative. Information as typed by Norm Brayshaw: "Coastal Shipping. From E. Cannington, 19 Collingwood St[reet], Nelson. The 'Kennedy' at Blenheim wharves April 1866. 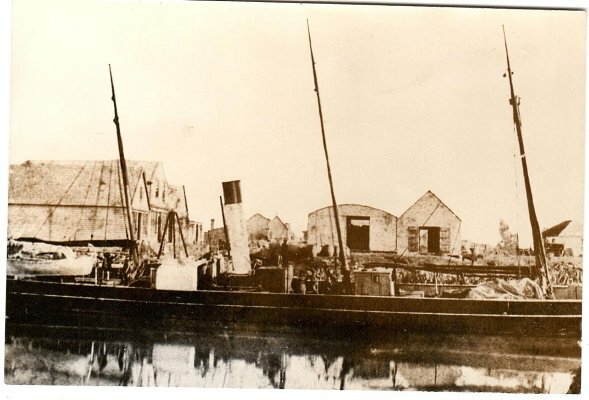 The hull of this ship was later acquired and sunk to form part of the breakwater at the Wairau Bar." Then handwritten by Brayshaw, "Capt[ain] Harvey - father of E.J. Harvey - was in charge of Kennedy for many years." A scan of this photograph will be used in the Changing European History Gallery 2 display in commemoration of the Marlborough Provincial 150th anniversary on 1 November 2009.